‘Start with Why’, is a best selling book by Simon Sinek. It tells you why ‘The Why’ for everything around you is important. Simon has written the book to inspire others to do things which inspire them. Here are some key things I learnt from the book. I’d like to share them with you. Perhaps this will convince you to read the book as well. 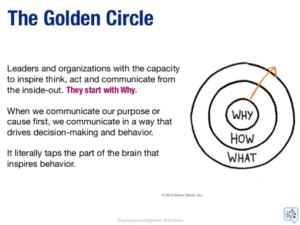 In this book, Sinek has introduced and explained concept of the Golden circle very well. It is the basis of the book. He has justified the concept with numerous examples throughout the book. “When most organisations or people think, act or communicate they do so from the outside in, from WHAT to WHY. And for good reason — they go from clearest thing to the fuzziest thing. We say WHAT we do, we sometimes say HOW we do it, but we rarely say WHY we do WHAT we do. Very few people or companies can clearly articulate WHY they do WHAT they do. By WHY I mean your purpose, cause or belief – WHY does your company exist? WHY do you get out of bed every morning? And WHY should anyone care? There are many other things in the book that opened my mind to a world of thought-provoking possibilities. I am summarising them here in point-form for easy reading. When we start with WHY in everything that we do, we inspire action in a way that WHAT doesn’t. That’s because WHY engages our emotions, while WHAT engages our logical brain. When we try to sell the WHAT, we have to rely on manipulations like price to influence people. When we focus on attracting customers that understand and believe in our WHY, we build trust. Trust leads to loyalty, and loyalty leads to word-of-mouth business. There are only two ways to influence human behavior: you can manipulate it or you can inspire it by giving purpose. Any manipulation is short term, Inspiration is long term. People who love work are more productive and creative. They go home happier and have happier families. inspired employees build stronger companies, economies and world we live in. I wrote this book to inspire people to do the things that inspire them so together we can build the world where trust and loyalty are norm and not the exception. For a deeper understand of the ideas I have touched upon, do read the book. It will be time well-spent. What’s more, the things you pick up from it will stay with you for years to come.